Apple executives showed off an operating system update planned for next month, teased a mobile OS update slated for the fall, and unveiled a cloud-based service for backing up and syncing documents, photos, and music. The previews came as part of the company’s Worldwide Developers Conference keynote, delivered by Apple CEO Steve Jobs, which kicked off the week-long meeting of iOS and Mac developers in San Francisco. The bulk of Apple’s Lion presentation Monday recapped many features that were first revealed last fall when Apple initially profiled its next major update to the Mac operating system. Many features that first appeared in Apple’s mobile iOS operating system are going back to the Mac with the Lion update. Among those features are support for multitouch gestures, fullscreen applications, and a new Launchpad feature that mimics the iPad’s home screen. 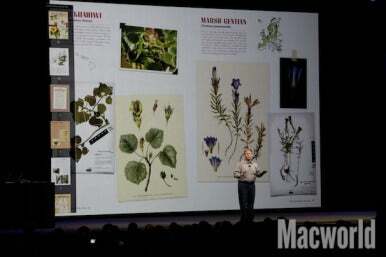 Apple’s Phil Schiller shows off Mac OS X Lion on Monday. Apple did offer some new information about Lion Monday—specifically, a firmer release date and a price. Previously, the company had slated Lion for a summer release; on Monday, it was more specific: The update will ship in July and cost $30. In a first for Apple, Lion will only be available through the Mac App Store, the online retail arm that Apple introduced in January, which will be a major part of Mac OS X Lion (10.7). On the developer front, Apple says Lion features more than 3000 new APIs that developers can incorporate into their applications, including versioning, push notifications, gesture tracking, fullscreen mode, and more. Just as the Keynote's Lion preview featured a rundown of 10 features planned for the update, so too did Apple’s iOS 5 presentation focus on 10 changes and enhancements to the mobile operating system. Apple says the iOS update, which is scheduled for a fall release, will bring 200 new features. Apple’s Scott Forstall previewed 10 new features planned for iOS 5. Perhaps the most welcome change will be an overhauled notification system that signals an end to modal, one-at-a-time pop-up alerts. Instead, iOS 5 introduces a Notification Center that combines all notifications in one place, and which you can access with a single swipe. Another huge change planned for iOS 5 is the ability to own an iOS device without tethering it to a computer for updates and downloads. New iPhones will now sport a Welcome screen for activating the device without having to plug it into a Mac or PC. Software updates and syncing will happen over the air as well. Other changes planned for iOS 5 include a new messaging app for all iOS devices, new features in the mobile version of Safari, single sign-on support for Twitter, a Newsstand app with more than a passing resemblance to iBooks, and camera improvements that will let you launch the app from the lock screen and use the volume buttons to take photos. Apple CEO Steve Jobs capped Monday’s keynote with a look at iCloud, Apple’s new wireless data syncing service for iOS devices, Macs, and PCs. A free service that takes the place of MobileMe, iCloud syncs contacts, calendars, and mail across devices. It also offers an auto-backup feature for backing up important data to the cloud. Steve Jobs shows off iCloud. Three new apps are part of iCloud. Documents in the Cloud uploads iWork documents for syncing. Photo Stream lets users sync photos taken on one device with other devices. iTunes in the Cloud lets users access songs already purchased through Apple’s iTunes Store to download to up to 10 devices. For music that wasn’t purchased through iTunes, Apple is offering iTunes Match, a $25-a-year service that scans your iTunes library and tries to match it with some of the 18 million songs that Apple sells. iCloud is slated for a fall release; it will arrive at the same time as iOS 5. Users will get 5GB of free storage for mail, documents, and backup; purchased music, apps, books, and Photo Stream photos don’t count against that total. You can see all of Monday’s announcements for yourself—Apple has posted a streaming video of the WWDC keynote on its Website. Apple’s video podcast page in the iTunes Store usually includes videos of Apple’s presentations as well—the 2010 WWDC keynote is available there—though this year’s presentation hadn’t appeared as of 2:50 p.m. on Monday. Updated at 2:51 p.m. PT to include a link to Apple’s keynote video.